Japan's embattled utility Tokyo Electric Power Co now expects the compensation costs after the Fukushima nuclear disaster to be more than $57 billion, the government confirmed Tuesday. It approved the latest rehabilitation plan drafted by TEPCO, which put the total cost for compensation alone after the 2011 tsunami-triggered accident at 7.08 trillion yen ($57.19 billion). The new higher estimate means the government will have to provide fresh public money of 950 billion yen ($7.68 billion), the eighth additional assistance on top of billions of dollars already allocated in previous years. A massive earthquake and tsunami wrecked Fukushima's cooling systems in March 2011, sparking reactor meltdowns and radiation leaks and causing tens of thousands of local residents to be evacuated. The compensation cost, separate from the cash necessary for decommissioning the reactors, is expected to increase even further, with a flurry of lawsuits being filed against the utility. TEPCO, which supplies electricity to Tokyo and its surrounding area, said it would also seek additional financing of 280 billion yen from banks. The government has poured billions of dollars into TEPCO to keep it afloat as it stumps up cash for decommissioning the reactors, cleaning up the mess from the disaster and paying compensation. Classic pennywise on cost cutting, pound foolish on resulting catastrophic disaster (see also Deepwater Horizon oil spill etc etc ..). And there was no Fukushima nuclear disaster, the tsunami is that was the real killer. How much was that power from Fukushima? The new estimate from engineers is 200 years to "clean up" the disasters. But "cleaning up" just means taking it somewhere else, because you cannot get rid of radioactivity. This nasty stuff contaminates everything it touches. Willie likes it. Meanwhile, they are still trying to build another sarcophagus for Chernobyol, decades later. ..cannot get rid of radioactivity.. This concern should include renewables that use rare-earth metals with traces of radioactive uranium and thorium. It was already accounted that renewables produce much more waste per terawatt-hour. This is right-wing "Capitalism", where the rich and powerful get the income, and we get the liability. Why are The People paying for the crimes of the corporations?? Last March a tsunami damaged the cooling systems of three reactors at the Fukushima Daiichi nuclear plant, causing the leak of high levels of radiation. Owner Tokyo Electric Power Company recently released its cleanup plan: a 40-year process of isolating the facility, draining fouled water, and dismantling the buildings." -Why dont you ref your crackpot sources in rebuttal? Unless you just made it up which is probable and most likely. Where are all the nuclear apologists?
" 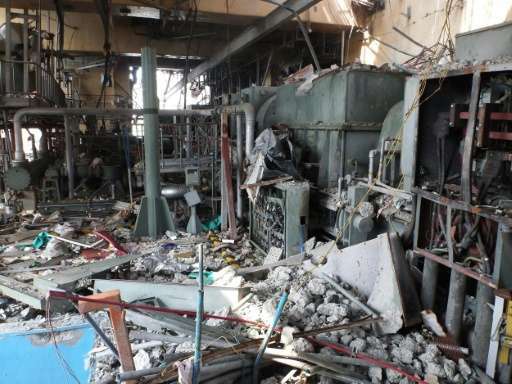 Owner Tokyo Electric Power Company recently released its cleanup plan: a 40-year process of isolating the facility, draining fouled water, and dismantling the buildings." Are those the same ones who screwed up and got us THREE complete meltdowns? Wasn't it supposed to be impossible to have a meltdown? Who believes TEPCO? otto? They haven't invented the special robots and facilities and mechanisms to even view the molten Corium, and you believe that silly 40 years? Were they "too cheap to meter"? "KEVIN KAMPS is a longtime leading opponent of government and industry efforts to dump nuclear waste at Yucca Mountain... Kevin also has extensive knowledge about the risks of radioactive waste generation and storage at reactor sites, and transportation through communities across the country. In addition, Kevin focuses on eliminating federal subsidies..." etc. "KK: Just in recent days there have been the admissions by high-ranking Tokyo Electric officials that the decommissioning of the nuclear power plant could take more like 200 years because of the lack of technology to do the job." -Also, no references. And like you there is no mention of related education or a degree. -He works for a tree-hugger organization called Beyond Nuclear, chaired by none other than ed asner. You know, from mary tyler moore? -I think Ill go with the experts. Or you can ref a direct quote from those who said it. No, otto I want you to guarantee it will be done in "only" 40 YEARS! The folk who melted down those reactors told you, the ones who lied, and you still believe them? Tell me how they are going to deal with the cores. Those are not mentioned in your "40 years" promise, are they? Was the power "too cheap to meter"? Fact is, nobody knows how to even view the molten cores now blobs of out-of-control Corium. It is so intensely radioactive, they cannot even view it with robots. But otto and Willie will save us. All we have to do is tell them what a nuclear containment looks like. They can figure it out from there, because they are smart, and they know them nukes is good for us. Earth's core is a molten rock due to natural radioactivity. Go to a safer planet. "Nuclear Fission Confirmed as Source of More than Half of Earth's Heat"
"Nuclear fission powers the movement of Earth's continents and crust.."
Willie is on Ignore, and I cannot see his stuff. Did he just volunteer to go into the containments at Fukushima? Volunteer yourself for cleaning up million bird and bat carcasses at wind farms. "..wind farms can pose real threats to bird species.."
"..potential to jeopardise threatened bird species such as eagles and vultures"
"..wind farms can have a devastating impact on the environment." "A 2013 study, cited in the Federal Register, found wind turbines nationwide killed 650,000 to 1.3 million bats in a year." No, otto I want you to guarantee it will be done in "only" 40 YEARS! Not my job. I caught you in another lie. Ed asner is not a reliable reference on nuclear disaster remediation, nor apparently are his associates because they fail to reference what they say. And neither are you. You cant produce a valid reference for the 200 year comment. Hint: the name george kamburoff is not a valid ref because he has proven himself to be a liar and a fabricator. Youll have to produce something real. "Psychopaths are notorious for not answering the questions asked them. They will answer something else, or in such a way that the direct question is never addressed. They also phrase things so that some parts of their narratives are difficult to understand. This is not careless speech, of which everyone is guilty at times, but an ongoing indication of the underlying condition in which the organization of mental activity suggests something is wrong." Tell everyone just what it is you are being treated for down at the VA. You seem eager to talk about it. otto, I love the way you need me.